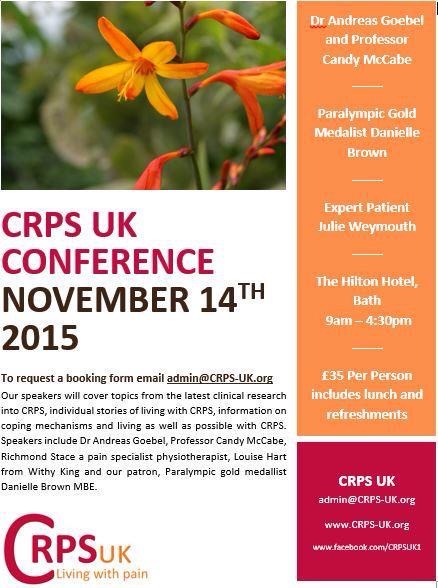 I was very pleased to be asked to speak at the CRPS UK Conference this year (see flyer for information). A few years ago I went to the conference and gave a talk about some of the latest approaches to treating CRPS, and since then there has been further progression in both thought and action. I will be looking at these developments as well as sharing the stage with Georgie who will be telling her story. Those familiar with the UP mission will know that we are delivering messages about pain based on fact and science, illustrated by people’s lived experiences that demonstrate how individuals can move forward and live meaningful lives by understanding their pain and knowing what they can do at any given moment. One of the problems with treatment and ‘sessions’ with healthcare professionals is that the actual face to face is limited in comparison to the rest of the time. Hence the individual must develop their knowledge and skills so that at any moment they can make a clear decision about the best course of action in terms of how they think and what they do. Arising as a solution to this problem, I developed Pain Coach, which is not only about coaching the individual in pain but also guiding them to become their own coach. This is a blend of the latest neuroscience, thinking in pain and a strengths based coaching model — we all have strengths and values that we have used in our lives, and we can use these for success with our painful problems as well. The CRPS UK conference will be off the back of the UP event at Heathrow in October, so we shall be full of beans! UP uses singing and music to deliver our messages, but I leave that to Georgie and her choirs — I will not be subjecting you to my tones!